A SCART connector is a physical and electrical interconnection between two pieces of audio-visual equipment, such as a television set and a video cassette recorder (VCR). Each device has a female 21-pin connector interface. Stereo audio, composite video, and control signals are provided in both directions. RGB video signals are input only. The interface is an industry standard originated by the French company, Peritel. Today, most new television sets and VCRs in the European market and other countries that use the PAL video standard come equipped with a SCART connector. SCART stands for Syndicat francais des Constructeurs d'Appareils Radio et Television. 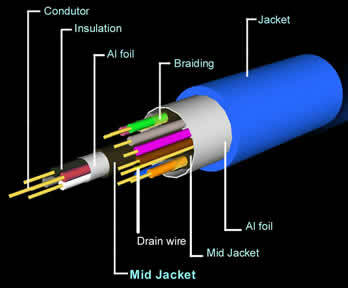 The connector is also known as a Euro-connector. The latest generation of high resolution A/V sources like hi-fi VCRs and DVDs can bring today's films and sound tracks to life in your living room. But no matter how state-of-the-art your A/V system may be, its performance may be compromised unless you're hooking it up with high performance interconnects. Many people hook up their A/V systems with ordinary SCART interconnects which offer the convenience of error-free hookup, but lack any significant technology inside the interconnect. As a result, even the highest performance components deliver a dull, fuzzy picture, poor colour rendition, "ghosting" and audio distortions. The THOR SCART interconnect is designed for high performance. 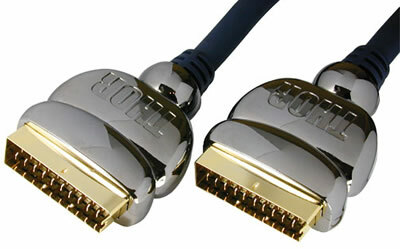 Each of the coaxial conductors offers true 75 ohm impedance for improved video performance. 100% breaded copper shielding around both the audio and video conductors minimize crosstalk and provides maximum interference protection. Special locking collar holds connection in place�won't accidentally pull out. Heavy mass ground shell made up of 100% brass with hard wearing gun metal coating for more contact mass. Precision machined to ensure the best possible signal transfer.